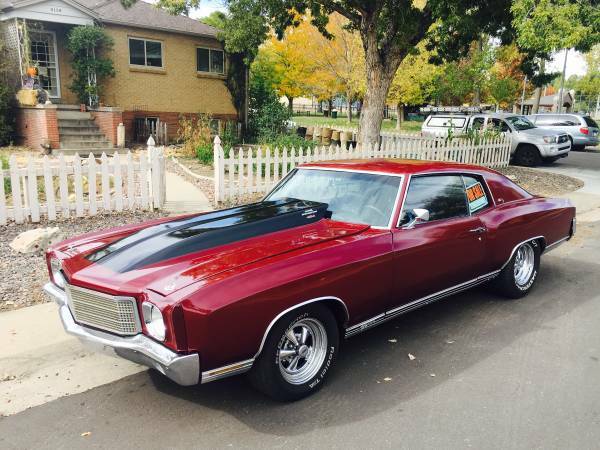 For sale is my 1970 Chevy Monte Carlo SS 454. Asking $25,000 or best offer Located in Denver Colorado. 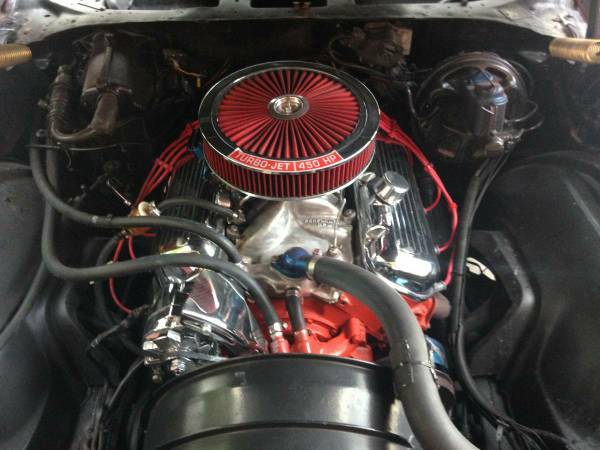 The vehicle vin number is 138570f111558 This is a True SS super sport numbers matching car. 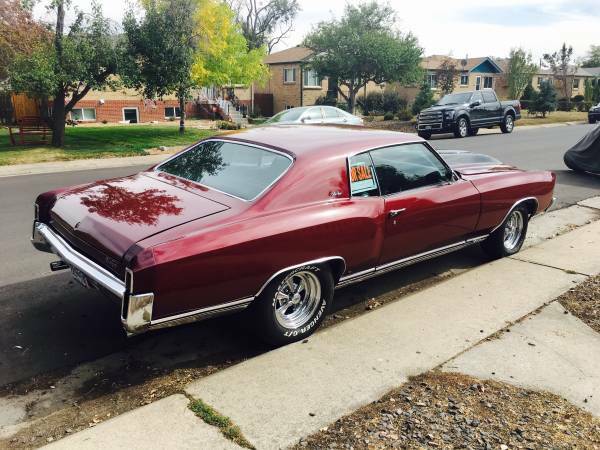 this car is a true SS with a matching numbers 454 big block and matching numbers transmission. The original transmission has just been recently completely rebuilt as of 9/30/16 with a new stall converter and 3 year warranty. Freshly painted the original Black Cherry color. This car has less than 2,500 miles on a full rebuild from the ground up. The car has no major mechanical issues and very few imperfections. No rust. Below is everything that has recently been rebuilt and done to the car. 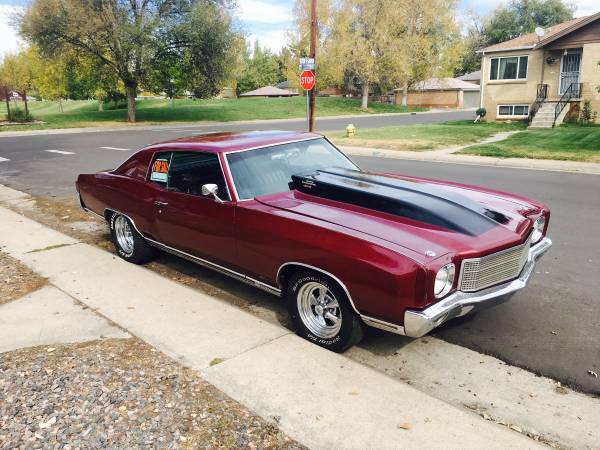 Please call 303-356-4688 private message me any questions about the vehicle and I will be happy to answer them. Full history on the vehicle is available. Engine Built by Don Carder 50 year Nascar, NHRA, and USAC engine builder. - Ls5 454 numbers matching. - Original block and head, bored 30 over. Block was line bored and height decked. - Head was surfaced .007, ported and polished and chambers CC'd. - Manley valves, Isky racing springs, titanium keepers, long throw rockers. - Isky anti-pump up lifters. - High performance GM Rods & Pistons. Everything balanced properly. - Edelbrock performer intake manifold match ported to the heads. - Holly 850 dual chamber carburetor. - Aftermarket RPM tach with shift light on steering column. 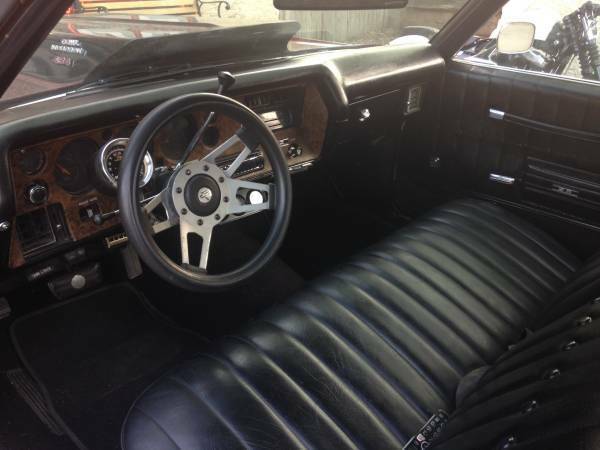 - Door panels could use a reupholster, some fading on the door panels. - Fresh Black Cherry paint. Original color code. - 3inch stainless steel flow master exhaust system. - Richmond locker rear differential 373 gears. - Complete suspension and brake system rebuilt, everything new. - Original SS stainless steel trim for vinyl top included. Last edited by cshrad12; October 31st, 2016 at 2:29 PM.